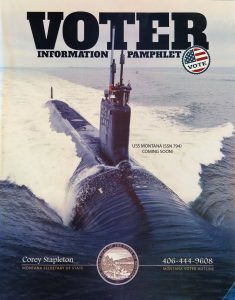 The pamphlet has a cover photo of a Virginia Class nuclear-powered attack submarine like the future USS MONTANA that is now under construction. Inside, Secretary Stapleton’s letter to voters further reminds that “…valiant men and women…have risked and given their lives so that we might become an even better nation.” He then discusses the future USS MONTANA whose crews will defend our nation for decades once it is commissioned into the Navy fleet. Read the Voter Information Pamphlet, including Secretary Stapleton’s entire letter on page 1, here.